28pp 185 x 115mm printed digitally and casebound with embossed image. An essay on the specificity of its subject. In order that Les Nymphéas might be accommodated in the Musée de l’Orangerie in 1927, the paintings had to be prepared in sections. 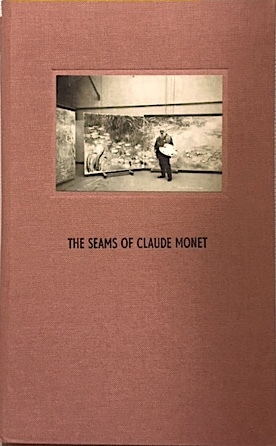 For his purpose of instantaneous tonal perception, Monet painted false seams onto the canvas, thus rendering the breaks in the structure of the room, the real seams, indistinguishable. What was made as an astute gesture on the part of Monet, becomes upon further reflection an irony on the whole theoretical aims of the Impressionist movement. A spectator becomes accustomed to seams.